Tutorial: Fold a Sakura Bloom! Ever wonder how to get your sakura bloom ring sling back in the pretty box? Now fold the pouch area. I take a bit of fabric from each side. Try to eyeball the size of the box so you have a guide. Now you are folding the tail over the pouch area. Start with the side without the label first. Now fold the side with the logo over. Smooth out wrinkles with your hands. Sometimes the fabric bunches up around the ring area so you might have to do a bit of smoothing out. Silk fabric is a bit easier to fold than the linen fabric. 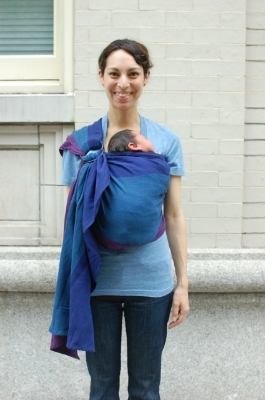 Now turn the sling around and start folding the sling. I usually start out with the side of the ring. Turn over the sling so the label shows. ever wondered how to get a sakura bloom ring sling back in the box?